Our new Rack Armour guard is made from reprocessed plastic. This protector is just as strong as our original Rack Armour guard, and just as cost effective. It reduces racking damage, saving you time and money. The installation is simple, as the guard just clips around the upright, with no extra fixings required. 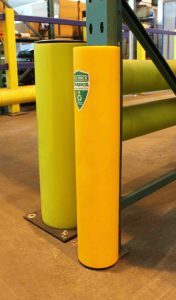 The colour is different to that of the oringinal Rack Armour upright protector, but is a safety yellow so is still easily seen. Affordable, flexible options to suit your budget. Invest to save. Available NOW!!! Available to the UK and Europe only. Call us now for more information.